JD was used from 2005-2006. Normally I don't buy goats from auctions, and JD was the only one I've ever bought like that. I was at a end of the month goat auction and was looking through the pens before the sale when I saw him, a awesome looking gold & white fainter buck. 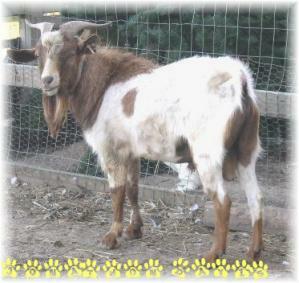 He stood out from all the other goats which were mostly dairy breeds or Boers. Well I 'knew' I had to have him! I got a bidder number, and sat down in the front row. Well, being this was the first time I've ever bidded in an auction, I had no idea what was going on! When JD came into the ring, two meat buyers (eep!) started bidding on him! Well I was trying to get the auctioneer's attention so I could bid but he was focused on the two meat goat buyers in the back. A lady next to me explained that once one of the bidders backed out the auctioneer would see how high I would go for JD. Soon enough one bidder dropped out and it was between me and the meat buyer. Well I couldn't understand a word of what the auctioneer was saying, he talked so fast. But it ended up I bought JD for $79.00! JD produced wonderful offspring, and I have his twin daughters out of Elsie, Shiva, Sinnamon, and then my friend has Patty & Angel who are out of him as well. They all kidded and had awesome kids. JD was poisoned by someone and past away last year, but his daughter Patty had twin bucklings, one solid gold, and the other gold & white and I am keeping his granddaughters to continue his line.